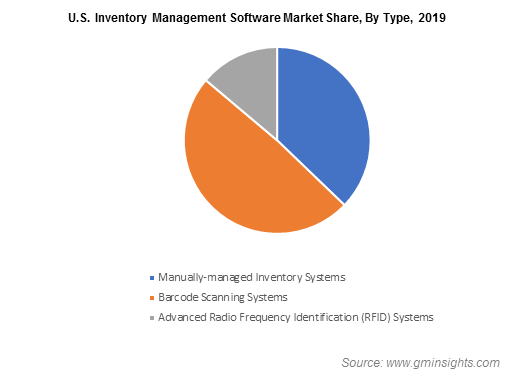 The global inventory management software market has grown remarkably over the last decade with the shifting trends toward automation for curbing inventory costs and maximizing sales. Earlier, owing to the practice of deploying manual labor, flawless efficiency was difficult to come by, hampering the productivity of the organization. Considering the benefits of inventory management software for handling stock effectively, tracking, and analyzing the flow of goods from manufacturers to the customers, several industries have been deploying this software on a large scale. The increasing importance imparted for inventory management to avoid instances of the product being out of stock and the like is likely to foster the inventory management software industry trends over the years ahead. In the last few years, the advent of next-generation technologies has emerged as a game changer for most of the industry verticals. For instance, after the launch of asset management software, the commercial real estate industry has experienced notable changes in its day-to-day functionality and operations. Advanced software has made financial calculations and modeling easier, thereby enabling easy and optimized management of actionable information. The contributors in the real estate industry have been using this software for making portfolios and analyzing real estate data. It is noteworthy to mention that the development of cloud-based systems has also had a positive influence on the demand for inventory management software. SMBs, healthcare service centers, pharmaceuticals, and automotive companies have been deploying cloud-based stock management software on a large scale to help their employees access data in real time. The capability of this software to update the stock level and sales conversions automatically eliminating the chances of stock-out and stock overflow will further stimulate the use of inventory management software. Currently, in order to stem the drug diversion, several hospitals across the globe have been implementing drug diversion programs. In this regard, they have been signing deals with the software providers to identify and prevent the diversion of drugs. For instance, few days before, through the drug diversion program, National Institutes of Health has provided USD 1,000,000 to the vendor at Piedmont Athens Regional Medical Center which is working with Invistics. With the help of Invistics, an inventory visibility software vendor, Piedmont is looking forward to track and identify the diversion of drugs across nursing and pharmacy departments. In addition to drug diversion, inventory management software can track medical records, wholesale purchasing, and employee time clocks. As of now, drug diversion is one of the major threats to hospitals and the rising usage of advanced software to combat the same will significantly propel inventory management software market share. Speaking about the future prospects of inventory management software industry, it is imperative to mention that the increasing deployment of the product will turn out to be highly rewarding for the market. The growing awareness among the commercial end-users about the use of stock management software has encouraged software developers to launch new ranges of products pertaining to which they have been able to secure better deals from their clientele. For instance, enterprise software provider, Ramco Systems has received an order from Advanced Global Resources LLC to supply its aviation suite which tracks and manages inventory effectively. Focusing on the flexibility, solution breadth, and mobile-friendly capabilities, the American technology provider has chosen Ramco’s aviation suite that will help them maintain advanced procurement, invoicing, inventory and vendor management. North America is anticipated to emerge as one of the most lucrative grounds for inventory management software market. The surging adoption of next-generation technologies such as the Internet of Things and cloud computing are slated to fuel the North America inventory management software industry outlook over the years ahead. Driven by an expanding e-commerce industry and a rapidly growing manufacturing sector that has been adopting industrial IoT on a large scale, North America held a dominant 40% of the overall inventory management software market share and is anticipated to grow at a commendable pace ahead. The shifting trends toward prominent use of software to automate inventory management facilities and integrate the entire business to fulfill customer expectations will have a positive influence on the product demand. The growing involvement of companies in stock audits at regular interval for predicting economic growth will also have a marginal impact on the industry size in the near future. Reportedly, as per Global Market Insights, Inc., overall inventory management software market will surpass a revenue collection of USD 3 billion by the end of 2024.